Most marine fish (and invertebrates) have a complex life cycle that involves a dispersing, planktonic larval stage—the time from egg hatching to juvenile development. These fish generally produce high numbers of eggs with larvae that develop in the open ocean for long periods (weeks to months). Fish larvae are fascinating animals. They are rarely seen underwater; enormously diverse in their developmental patterns; and physiologically, morphologically, behaviorally, and ecologically different from adult fishes. At hatching, they are generally microscopic (2–4 mm) and undeveloped, living off yolk, and incapable of feeding and swimming against currents. They learn to swim, hunt, and avoid predators as they mature through various stages. 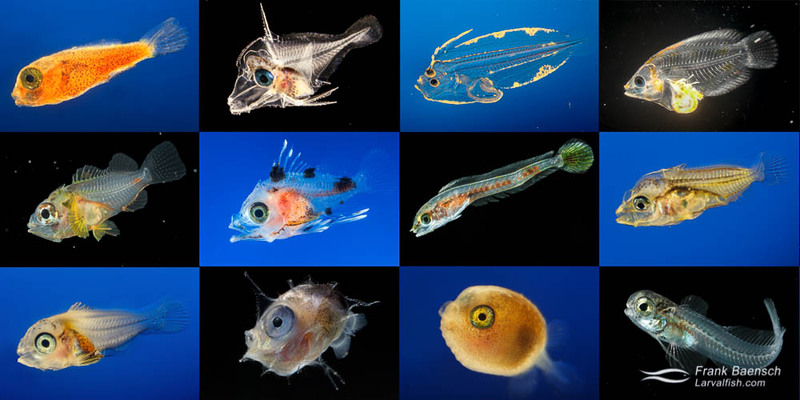 Many fish larvae are odd looking and have temporary specializations to survive in the pelagic environment such as freakishly large fins, heads, or eyes, as well as intricate and/or elongated spines, body armor, and/or various pigment patterns. When larvae are close to transitioning into juveniles, they typically use the sun, currents, and reef sounds and smells to find a new home. They make their final approach at night because the reef has many larval predators. Divers rarely encounter fish larvae. In fact, less than 10 percent of fish larvae have been described, much less photographed. Fish larvae are important in many aspects of aquaculture, fisheries conservation, and biology. show the diverse morphology, pigmentation, and natural beauty of live marine larvae using photography. The project primarily raises fish larvae from wild eggs. Collecting eggs from the ocean lets me work on a diversity of species without having to spawn them in captivity. Eggs are separated based on size, and similarly sized fractions are reared through settlement or to mortality in small 10–20 gallon (37–75 L) tanks. Using small tanks conserves water, algae, and live foods; allows for more replications in my space-limited hatchery; and lets me easily transfer the larvae when water quality deteriorates. The larvae are reared with wild and cultured copepod nauplii and ciliates. Isochrysis species (phytoplankton used to grow copepods) are added to the rearing tank to feed the live foods and provide a better feeding environment for the larvae. Species/genera that survive and show promising larval culture traits are then brought into the hatchery to spawn and further develop the larval rearing technique. Collecting wild eggs in the ocean has helped locate spawning areas and determine reproductive timing of Hawaiian fish species and is a cost-effective method to obtain a diversity of species for laboratory rearing. Laboratory rearing has provided information on the larval behavior and culture requirements of the various species and has also allowed the development of live and healthy larvae to be documented.